One defendant was acquitted and the jury announced that it was hopelessly deadlock on the conspiracy charge against Ligambi and two others. Jacobs and other defense attorney are expected back in court tomorrow to lobby for bail and to argue other post-trial issues. The government has not decided if it will retry the counts on which the jury deadlocked, Judge Eduardo Robreno formally declared a mistrial on those counts at the end of a roller coaster day in court that began with the jury announcing that it had reached partial verdicts in the case but deadlocked on others. Robreno urged the panel to continue, but by mid-afternoon the jury declared it was deadlocked and unable to go any further. The verdicts were read to a packed courtroom at around 3:45 p.m. Mob underboss Joseph "Mousie" Massimino, mob soldier Damion Canalichio and mob associate Gary Battaglini were found guilty of the racketeering conspiracy charge. The jury said it was "undecided" on similar charges against Ligambi, his nephew George Borgesi and Anthony Staino. Staino, a top Ligambi associate was found guilty of two counts related to loansharking charges. Those were the only other guilty verdicts announced by the jury. Mobster Joseph "Scoops" Licata was found not guilty. Licata, 71, faced no other charges. He was expected to be released shortly. The status of the other defendants could be determined at new bail hearings set for tomorrow, Ligambi, 73, and Borgesi, 49, held without bail since their arrests in May 200, are expected to reapply for bail while he government decides whether to retry on the charges that were part of the trial. Staino 55, and Battaglini, 51, have been free on bail and their lawyers are expected to ask that bail be continued pending sentencing which Robreno set for May. Massimino, 62, and Canalichio, 42, are expected to remain in he federal detention center. "I'm pleased with the result for my client," said Christopher Warren, Licata's lawyer who called the verdicts tantamount to a "wholesale acquittal. "In fact, the jury delivered not guilty verdicts on 45 of 50 counts tied to allegations of gambling, loansharking and extortion and hung of 11 others. Borgesi, who was finishing a 14-year sentence for an earlier racketeering conviction when he was indicted in this case, was found not guilty on 13 of the 14 counts he faced with the jury hung only on the racketeering conspiracy charge. The jury decision seemed to be a repudiation of mob informant Louis "Bent Finger Lou" Monacello, the key witness against Borgesi. "The jury is the last bulwark against government over-reaching," said Paul Hetznecker, Borgesi's attorney. Throughout the 10-week trial and in his closing argumens, Hetznecker offered a spirited and pointed defense built around that theme. Hetznecker said he will seek bail for his client and also continue to argue that, in his client's case at least, he no guilty verdicts appear to undermine and invalidate the racketeering conspiracy charge which is technically still pending. The jury fund Ligambi not guilty of five charges tied to gambling and loansharking and was hung on three others, two tied the operation of a video poke machine business and one count of witness tampering. 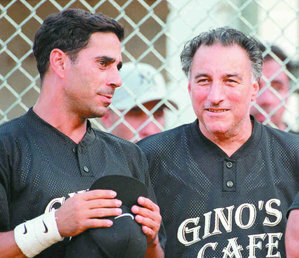 Ligambi is the fifth Philadelphia mob boss convicted of racketeering in the past 25 years to face racketeering charges. The others have been jailed and convicted. Two of those mob leaders, Nicodemo “Little Nicky” Scarfo and John Stanfa, remain in prison. Another, Joseph “Skinny Joey” Merlino, was released last year after serving a 14-year sentence . The fifth mob boss, Ralph Natale, became a cooperating witness and pleaded guilty to racketeering charges tied to murder, extortion and drug dealing. He also was sentenced to 14 years in prison and was recently released. With Ligambi's status still uncertain, mob watchers had been speculating on a potential power vacuum and who might fill it. One candidate is Merlino, 50, who has been living in Florida since his release. He has indicated to friends and associates, however, that he has no desire to return to South Philadelphia. Several top Merlino associates who were conivicted with him, are also free and have been identified by law enforcement authorities as still active in the underworld. That group includes mob leaders Steven Mazzone and John Ciancaglini. But both have maintained a low profile, opting according to several sources, to concentrate on making money rather than making headlines. Another factor in the Philadelphia underworld is the return of several members of the Scarfo organization who close to 25 years in jail following their convictions for racketeering in 1988. Scarfo, 83, is one of the last of 16 defendants convicted in that case to remain behind bars. His release date, according to prison records, is 2033. In effect, he is serving a life sentence. Mob boss John Stanfa, convicted in a 1995 racketeering case, was literally sentenced to life and has no chance to return to power. The convictions announced today capped a tumultuous jury deliberation process that took up 21 days over a four-week period. Two jurors were replaced by alternates during deliberations, one became ill and the other admitted to prior negative knowledge about a defense witness. Whether that second juror tainted the jury panel could be one area for defense appeals. The judge denied a defense motion for a mistrial over that issue during deliberations. Defense lawyers are expected to appeal on several grounds, but that process could take several years and offers no immediate relief for those convicted. Several of those defendants may also have more serious criminal problems connected to the unsolved gangland murder of John “Johnny Gongs” Casasanto in 2003. A key suspect in that case, mob soldier Anthony Nicodemo, was arrested in December for the shooting of a South Philadelphia man. Nicodemo has been held without bail pending a preliminary hearing scheduled for Feb. 20 in Common Pleas Court. Nicodemo is charged with murder conspiracy and related offenses in connection with the gangland-style slaying of Gino DiPietro, who was gunned down on a neighborhood street corner on the afternoon of Dec. 13. His arrest has sparked speculation that law enforcement authorities will pressure him to cooperate and tell what he knows about the Casasanto murder in order to help himself in the pending murder case. No one has been charged with the Johnny Gongs hit, but authorities believe it was tied to underworld unrest at a time when Merlino and Ligambi were sharing power. Authorities would like to link both mob leaders to that shooting and have mentioned several other mob figures, including Canalichio, as individuals who may have knowledge about what went down and why on the night Casasanto was shot in the back of the head. He was found sprawled on the floor of his rowhouse kitchen, leading to speculation that he knew those who killed him and let them into his house. Philadelphia Police homicide detectives have a substantial file on the murder case and have interview potential witnesses. Investigators have a theory about how the murder took place and who was involved, identifying two shooters and a lookout. But to date they have not had strong enough evidence to make any arrests.